Did you know that our community tends to use more electrical energy than the state and national average for our homes? It’s true. According to the U.S. Energy Information Administration in 2017; “the average annual electricity consumption for a U.S. residential utility customer was 10,399 kilowatt hours (kWh), an average of 867 kWh per month” (Energy Information Administration). In our community we tend to average 1,200 kWh per month. The average in Oregon is around 900 kWh per month. There are many reasons for this. One reason is that many of our homes and businesses were constructed before energy efficiency standards were developed, and as a community we’ve lagged in making those investments to ensure our heating and cooling options are returning the most value. Another reason, to put it simply, is that our rates have been historically low enough that the cost pressures didn’t exist to incentivize investment in new windows, insulation, heat pump vs furnace/air conditioning, or similar. We work very hard to keep rates stable and low. 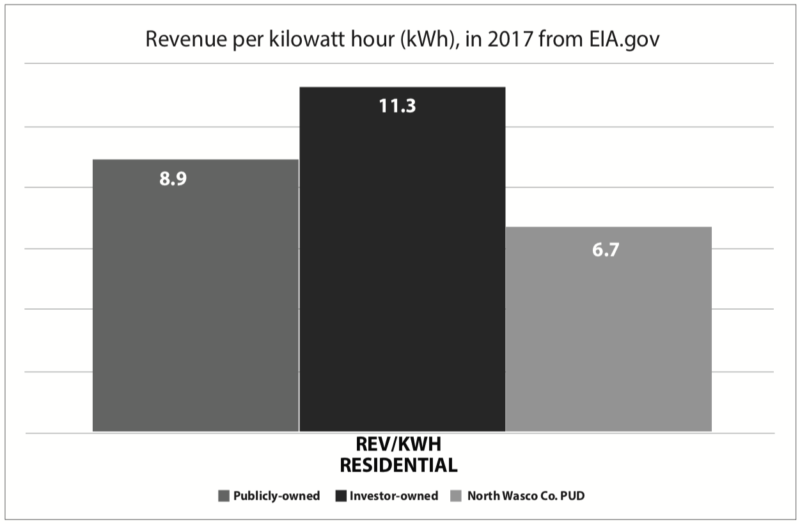 We do not forecast a residential rate change in 2019 and expect to continue to be one of the lowest-cost energy providers in the state, and the lowest in the gorge. That stated, our energy procurement costs are still the largest piece of your PUD’s overall budget. Please help us reduce this expense and your personal energy bills. The best way to accomplish this is to have a free energy audit conducted by PUD staff. Once that is completed, we can work together to see what measures are most appropriate for your home. If you happen to be a renter, we have programs available for you and the property owner as well. This is the time of year when bills can get high due to maximum energy consumption to heat your homes and businesses. Please help us conserve energy and make those bills as low as possible. For those that are able, this is also the time of year community friends and neighbors may need more help paying those bills. Please consider donating to the Neighbor to Neighbor Program to help.